Think about the last time you felt seriously unproductive. Not the casual “I feel like going to the beach and taking a day off”, but the “I don’t want to get out of bed and reply to dreaded e-mails” kind of unproductive. Now, let me ask: Did you brush your teeth? If you said “yes”, then you’ve experienced the remarkable resilience of ingrained habits. However stressful or depressed we may feel, they stubbornly keep us going. Like building relational redundancy, enduring habits are an effective way to stay productive in times of distress. 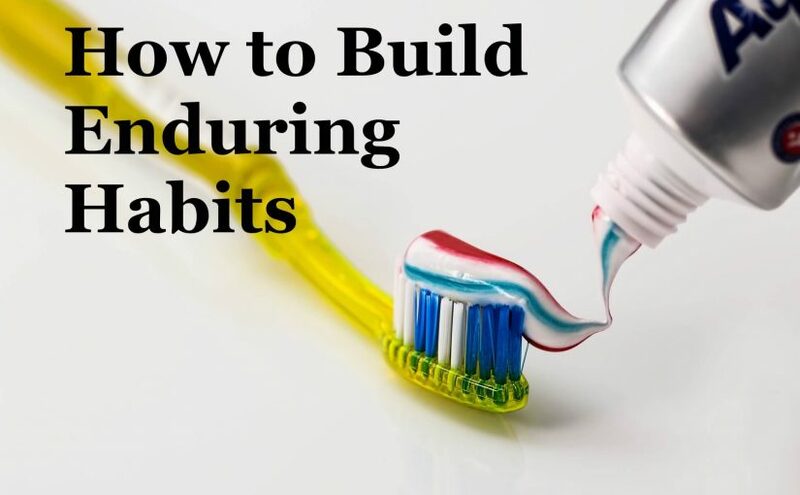 So how do you build a habit that lasts? 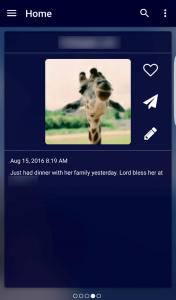 In this post, I want to use the prayer app Ceaseless as a case study for habit formation. For deeper insight, check out books like The Power of Habit: Why We Do What We Do In Life and Business (affiliate link) and Transform Your Habits: The Science of How to Stick to Good Habits and Break Bad Ones. In one of his letters, the Apostle Paul writes, “Rejoice always, pray continually, give thanks in all circumstances; for this is God’s will for you in Christ Jesus.” (1 Thess 5:16 NIV). While there are several ways to interpret this verse in context, all of those ways include the notion of habitual prayer. And therein lies a unique problem. Can we apply science and technology to these spiritual problems? I believe the answer is yes. Humans are both physical and spiritual beings. This overlap is precisely where technology can make a difference. One common insight from the science of habit formation is the habit loop, a virtuous cycle characterized by Reminder, Routine and Reward. 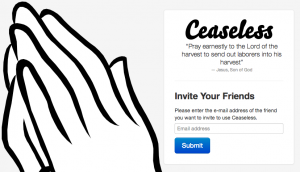 Ceaseless helps people “pray continually” by nudging each part of this cycle forward. The first step to build a new habit is to connect it to an existing one. Ceaseless does so by showing a daily reminder in your smartphone’s notifications. 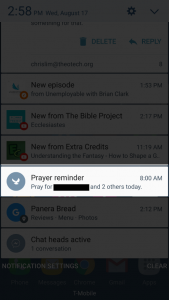 Since you’re already in the habit of checking and acting on your notifications, you’ll also remember to pray for others. Tapping on the notification opens the app. When you open the app you see a person’s face, name and story (notes you’ve written to help you remember how to pray for them). Note: the very first screen is an inspiring picture and Scripture to help you focus. You see everything you need and nothing distracting. The app has chosen three people from your contacts and all you do is take a moment to pray for each of them. Feel rewarded for completing the habit. 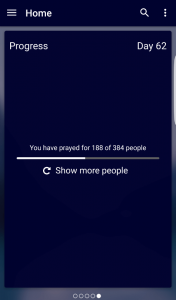 After you swipe through the people to pray for, you get a short-term reward: a progress bar shows how many people you’ve prayed for so far. You also see the number of days you’ve prayed for others. The long-term reward is of course the joy of loving others and watching God graciously respond to your prayers for their lives. 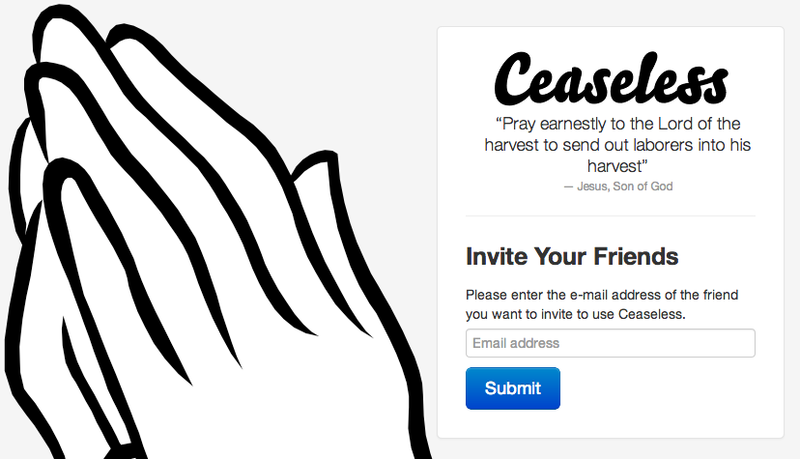 After using Ceaseless for over a year, my prayer life has never been more consistent. I’ve been through some very difficult ongoing trials and to my surprise God has used the app to keep me from drowning in the seas of self-pity and despair. The daily nudge God-ward and out-ward to others has helped me press on in my calling. For Christians: God has not left us powerless. While our flesh may be weak, we have been given the Spirit. Effective habit formation does not undermine grace, but is a good use of the grace God has already given us in order to obey Him. What existing habits can you use to start new ones? How can you simplify the habitual action so that it becomes sustainable? What short-term reward can keep you motivated until you start enjoying the long-term benefits? What habits are worth adopting? What am I being productive for? These are the questions I plan on exploring in my next post. I’ve thought about [Twitter integration], but I’d like to focus on helping people pray for others more than for current events–unless you [are finding] that people frequently tweet prayer requests. Instead of overwhelming [someone] with the latest current events/the firehose of tweets, I’d like to promote a consistent, long term, reflective atmosphere of prayer that over a year or a lifetime helps [them] pray for the things that matter to God (and [to them]). I would like to enable people to make prayer requests, but I haven’t really thought through how that would work well (also concerned about privacy and security issues that I feel like I can’t do a good job addressing yet in my current situation). Since everyone is incredibly busy and the list of things to pray for can feel overwhelming to the point of guilt-ridden indifference, I’m trying, God-willing, to create the opposite experience. Regular prayer. Reflective [instead of reactive]. Scriptures to help you learn to pray. Just enough so you aren’t overwhelmed (in the negative sense of the word). All this coupled with a process that helps you pray for the full range of God’s purposes in the world–filling in the details of “Thy Kingdom Come, Thy Will be Done”, if you will. Thanks for the suggestion and for thinking of me too! If you have any questions or suggestions, please leave a reply in the comments. Or if you’re ready to sign up, you can do so here.